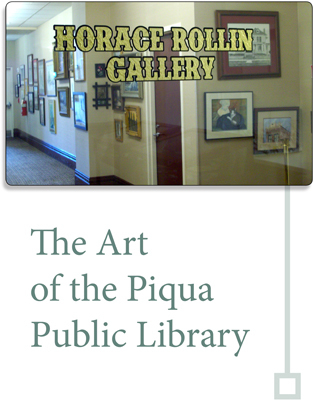 Today, I posted the first Piqua Library gallery booklet to the ISSUU site. The handy thing about ISSUU is that the link can be shared on our library’s website, in our Facebook and Twitter feeds, and in other places like this glorious Marketing 231S blog. ISSUU also has a smartphone app, so you can theoretically browse through the descriptions in the magazine while you are walking through the exhibit space. The site converts a standard PDF file into the flippable magazine-style design automatically. In fact, I was able to upload the same PDF that I supplied to the printer for the hard copies. The print copies ordered are being distributed to area art teachers, along with an info. packet about our hours and scheduling tours. Hopefully, this will drive some field trip groups to the library. An inexpensive black and white version of the booklet is also being printed and staple-stitched in-house. This will be available to patrons to borrow when they are walking the gallery space, in case they are smart phone challenged like me. We rotate the exhibits every few months, so this will be updated occasionally. Next time, I will work a bit harder on the photography, establishing a space for more of an oversized stat camera setup. Plus, we should have a new digital camera after the first of the year. Our Director wrote all of the copy… so don’t judge him too harshly, but I’d like to wrestle some of the text out of his hands if I can. This entry was posted in Uncategorized and tagged art gallery, cross platform marketing, digital media, exhibit booklet, ISSUU post, latest project, library marketing, new format, non-profit marketing on September 22, 2014 by newsalemfarm.